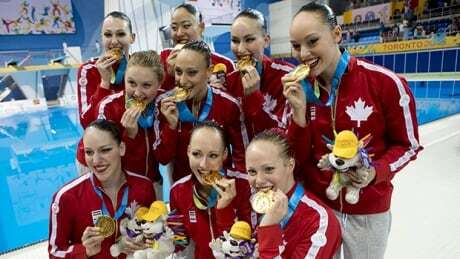 The women's Canadian synchronized swim team successfully defended its Pan Am Games gold medal in Toronto on Saturday. 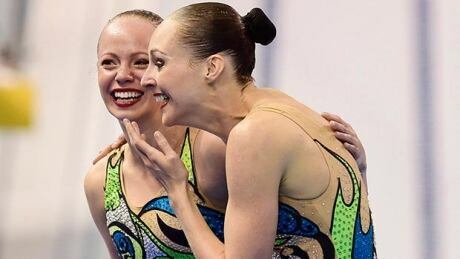 Jacqueline Simoneau and Karine Thomas earned Canada's second Pan Am medal on Saturday, a gold in women's duet synchronized swimming. 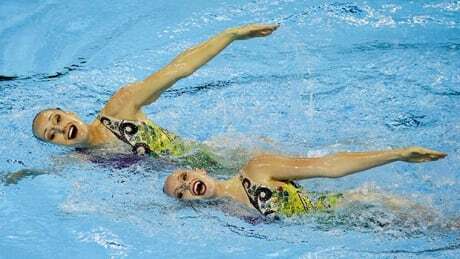 Gold medal favourites Karine Thomas and Jacqueline Simoneau are first in the synchronized swimming duet after the technical routine Thursday at the Pan Am Games. Synchronized swimmers Jacqueline Simoneau and Karine Thomas will lead nine athletes and one alternate into the 2015 Pan Am Games in Toronto, the Canadian Olympic Committee and Synchro Canada announced Thursday. You are currently browsing the archives for the Sports/PanAm (Actual)/Synchronized-Swimming category.